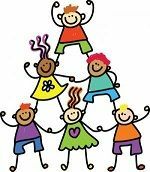 Wednesday, Sep. 5, 10:30 - 11:15 a.m.
All designed to offer your preschooler a fun library experience! ** We encourage parent involvement and require all adult caregivers to remain in the room during storytime. ** Please limit conversations with other adults, and silence cell phones during storytime. ** Preschoolers are encouraged to sit, stand and practice self-control for longer periods of time than toddlers. ** "Photographing, filming, or recording of any type of library programs or facilities, library staff members or library patrons without prior permission from the Library Director is prohibited".